I chronicled mortgage finance Bubble excess on a weekly basis. Relevant data were right there in plain sight, much of it courtesy of the Federal Reserve. Yet only after the Bubble burst did it all suddenly become obvious. Flashing warning signs were masked by manic delusions of endless prosperity and faith in the almighty "inside the beltway". These days, data for the global government finance Bubble is not as easily-accessible, although there is ample evidence for which to draw conclusions. It will all be frustratingly obvious in hindsight. U.S. government debt surpassed 100% of GDP during the quarter. Japanese government debt-to-GDP ended the quarter at 224%, the euro area at 101%, the UK up to 105% and the emerging markets to 48% of GDP. To see non-productive U.S. government debt, the foundational "Core" of global finance, inflate so rapidly should be quite distressing. Worse yet, extreme Credit excess is systematic, as debt balloons also at the "Periphery". From my analytical perspective, we're witnessing catastrophic, all-encompassing "Terminal Phase" excess. The first quarter saw emerging market debt rise by $2.5 trillion, or about 18% annualized, to a record $58.5 trillion. EM Non-financial Corporate debt surged $1.5 Trillion, or about 25% annualized, to $31.5 TN - and now exceeds 94% of GDP. One big final blow-off setting the stage for crisis. Total aggregate finance expanded $176 billion during June, up from May's $115 billion but 16% below estimates. Aggregate Finance grew $1.36 TN during the first-half, about 18% below comparable 2017. The growth in Bank Loans surged $274 billion in June, up from May's $175 billion and the strongest expansion since January. Meanwhile, key "shadow banking" components contracted. At $106 billion, growth in Household (chiefly mortgage) borrowings remained strong. June's jump in Chinese bank lending surely emboldens those with the view that Beijing has everything in control - that Chinese officials will adeptly commandeer the financial system to ensure sufficient Credit growth and liquidity. It likely won't be that simple. Chinese banks and corporations have issued enormous quantities of marketable debt over recent years, a significant portion denominated in dollars. A massive bank lending campaign at this stage of the cycle will not be confidence inspiring. After widening 120 bps in four weeks, Asian high-yield spreads on Wednesday were at the widest level since the Chinese mini-crisis back in Q1 2016. China CDS ended last Friday's trading at a 13-month high (73bps). As noted above, the rout over the past two months has left Chinese junk yields at the highs since early-2015. This is creating quite a dilemma for the Federal Reserve. Cracks in the Global Bubble's "Periphery" are putting downward pressure on Treasury yields, in the process loosening U.S. financial conditions in the face of cautious Fed rate increases. The booming U.S. economy at this point beckons for restrictive monetary conditions, yet a more hawkish Fed risks spurring a dollar melt-up and full-fledged EM financial crisis. From the currencies to market yields and yield curves to commodities, markets are signaling trouble ahead. The great irony is that Cracks at the Global Periphery now work to prolong "Terminal Phase Excess" at the "Periphery of the Core" - certainly including higher risk U.S. corporate Credit. And booming debt markets feed a highly speculative equities Bubble right along with an overheated U.S. Bubble Economy. After years of Easy Street, central banking has turned into quite a hard challenge. - In 2018, I've variously attempted to disabuse readers of the notion that I fall into the same category as other notable pessimists. - Amusingly, that effort has coincided with the realization of a number of event risks that actually lend credence to the bear case. - Nevertheless, I'm still going to try and present the most balanced macro take possible, even when the storm clouds are gathering. - Here's an in-depth, cross-asset look at the environment as it stands right now. You can't make an omelette without breaking a few eggs, and in my case, "you" can't make an omelette period, because breakfast is something that's always eluded my rudimentary cooking skills (long-time Heisenberg readers know I can cook a mean NY Strip, though). The figurative omelette I set out to make in 2018 involved disabusing readers of the idea that my musings and various missives somehow belong in the same category as those emanating from a handful of big name pessimists and doomsayers. Initially, I didn't mind being branded a pessimist, although I would have really preferred "cynic". But the mischaracterizations started to grate a bit as the "brand" grew. Some time late last year, folks started to make direct comparisons between me and other specific bearish commentators. At that juncture, I decided to make a concerted effort to recalibrate reader expectations, mostly because I didn't want my personal site to become a haven for geopolitical conspiracy theorists. I'm a trained political scientist and I come from a family of academics that dedicated their entire lives to teaching liberal arts at the graduate and undergraduate level. My formal training in finance and economics was borne out of necessity when I decided to break with family precedent by not becoming a college teacher. But the finance bent never diminished my passion for political science and long before I adopted the pseudonym, my raison d'être revolved around the notion that geopolitics and markets are inextricably bound up with one another and you can't properly understand the latter without studying the former. Political science is obviously not a so-called "hard" science, and neither is economics, economists' protestations notwithstanding. But there's a fine line between, on one hand, acknowledging the inherent absurdity in using the word "science" to describe the study of politics and, on the other, making a mockery of the entire endeavor by pushing wild conspiracy theories. Long story short, I was getting a lot of the latter in the comments section of my own site and that started to beget similarly far-fetched theories about central bank conspiracies. Invariably, that rather toxic combination manifests itself in predictions of 75% market crashes, calls for gold soaring to $30,000 and other various shenanigans. I have no patience for that. It flies in the face of my respect for academic rigor. So, I started to infuse explicit caveats in my writing designed to make it clear that I'm not the bear you're looking for. Perhaps the most concise example of that effort can be found in "Albert Edwards Returns From Yosemite, Disagrees With Other Notable Bear When It Comes To Forest Fires", but on this platform, my shift in strategy has probably been most evident in my rather effusive praise for Mario Draghi and in my recent critiques of Jerome Powell's "plain English" approach to Fed communication. Rekindling the metaphor I employed here at the outset, some eggs were indeed broken on the way to making my omelette. A few readers were seemingly disillusioned to learn that while I'm no fan of the post-crisis monetary policy regime and the distortions it's created across assets, I am a fan of the artistry involved in the maintenance of that policy regime. Similarly, I'm not a believer in the notion that central bankers set out to exacerbate wealth inequality (remember, enacting policies that you know will come with undesirable consequences is something entirely different from choosing those policies because they will bring about those consequences). Nor do I subscribe to the idea that creative destruction (i.e., some kind of "once and for all" purge of misallocated capital that involves a global depression) is something that's feasible, let alone desirable. In short: the "great reset" isn't coming. So if that's the rationale behind your wall-safe stuffed with physical gold coins, you might want to rethink that asset allocation decision. I lost some followers on my site once folks figured out that I'm actually in the business of providing halfway serious analysis and, more amusingly, I left some Heisenberg Twitter critics flummoxed when I delivered critiques of the people they were comparing me to that were far harsher than anything they were prepared to say publicly. The irony in all of this, is that 2018 turned out not to be a great year when it comes to making a concerted effort to shake the "permabear" label. Part of me reveled in the collapse of the short VIX ETPs and the extent to which the subsequent systematic de-risking (which saw CTAs and risk parity mechanically unwind somewhere between $200 and $300 billion worth of equity exposure) validated my long-held "doom loop" warnings. But another part of me felt a little bit bad about it because when I went back and read my posts about those products for this platform, I realized that I should have been a bit more explicit about the fact that what I was predicting was a near certainty (as opposed to a worst case scenario). As a reminder, I repeatedly warned readers here that the levered and inverse VIX ETPs were accumulating a massive amount of rebalance risk that, if triggered, would mechanically involve panic-buying VIX futures into a volatility spike. On February 5, that rebalancing flow was a 23-standard-deviation event (charts below show the VIX ETP rebalancing flow on February 5, left pane, and the estimated combined de-risking in CTAs and risk parity strategies that occurred on Friday, February 2 and the following Monday). While markets recovered from the February VIX quake, the newsflow since then has been unrelenting in terms of telegraphing event risk, whether it's trade wars, emerging market fragility, Italian political turmoil, regulatory risk in tech or domestic political friction in the United States. As I've tried to make clear in a number of recent posts, U.S. equities (SPY) are an island, of sorts. They are one of the only things that's still working. So when it comes to timing, I could have picked a better six months when it comes to trying to convince people that I'm not a hopeless pessimist. That is, if you had to pick two six-month periods since the European debt crisis when it made sense to be a pessimist, one would be the second half of 2015 (following the yuan devaluation) and the other would be now. But that's how these things go. Markets have a penchant for making folks look silly; it's almost as if they (markets) are somehow capable of having a sense of purpose, despite being inanimate capital allocation mechanisms. Recent surveys of institutional investors conducted by some of the major banks betray a sense of angst with regard to the growth outlook. To the extent large allocators of capital are worried, that consternation stems primarily from the prospect of trade tensions leading to a synchronous downturn in global growth. That said, most people seem to think the drag will be minimal, if not entirely inconsequential. 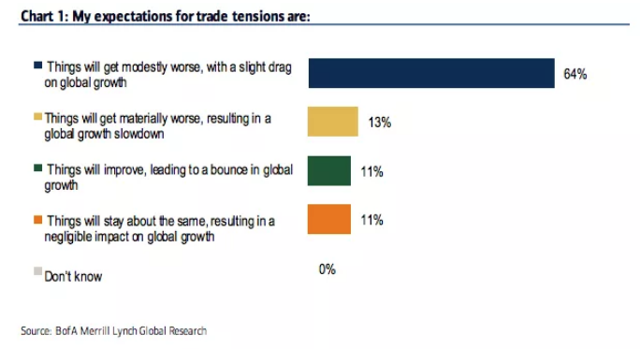 Similarly, in their latest rates and FX survey conducted on 06-11 July and representing the views of 58 fund managers responsible for $286 billion in AUM, BofAML found that 64% of respondents believe trade tensions are set to get “modestly worse” resulting in a drag on global growth. 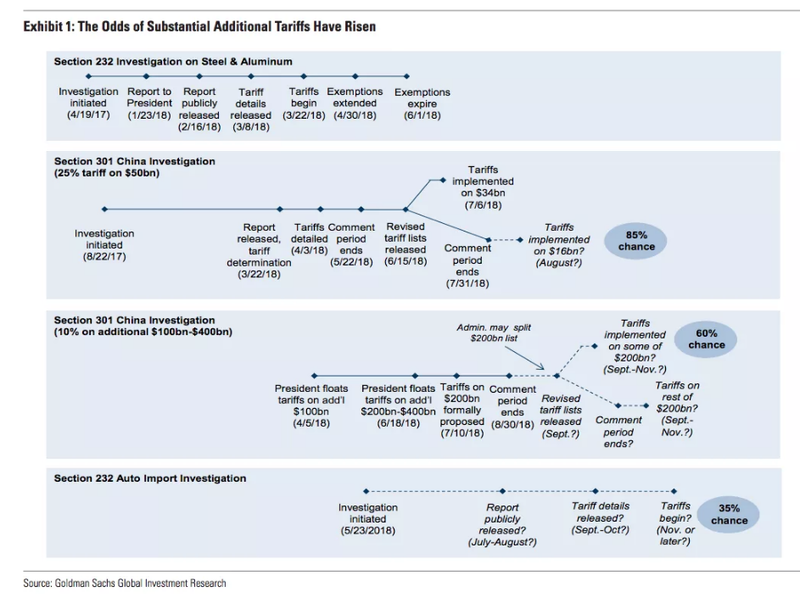 For their part, Goldman raised the odds of a material escalation in trade tensions between the U.S. and China to 60% in a note out Friday. Still, there's a demonstrable tendency for large investors (and analysts, for that matter) to doubt whether the trade tensions will ultimately morph into something that will be serious enough to catalyze a painful correction. 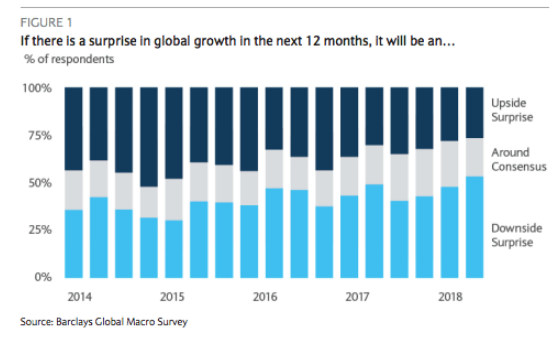 That relatively benign assessment is at odds with the consensus view on emerging markets (consensus is very cautious there) and the dour outlook for EM is part and parcel of the assumption that the Fed's near-term hawkishness will continue to exert pressure on developing market assets which have benefited in recent years from carry-inspired flows. When it comes to the Fed, there's a sense that sooner or later, Jerome Powell will have to relent in the face of EM pressure and the prospect of trade tensions weighing on the growth outlook. All of this isn't entirely consistent. That is, it's difficult to reconcile the contention that trade frictions don't pose a meaningful threat to global growth with the notion that the Fed will have to end normalization "early" (and "early" is of course a relative term in that context). It's possible to couch the argument about an early end to Fed balance sheet normalization in technical terms. 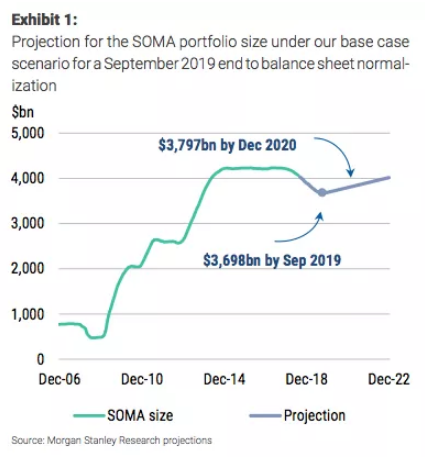 This week, Morgan Stanley was out with a great note in which they suggest that too much balance sheet normalization risks driving the effective federal funds rate above the rate paid on excess reserves, an outcome which increases the chances that EFFR rises above the target range. This is an in-depth, technical discussion (the note is a full 77 pages long), and if you want the longer treatment, you can find more here. But for our purposes, suffice to say that simply lowering IOER relative to the upper bound (as the Fed did this year) might not ultimately be sufficient to incentivize larger banks (where reserves are concentrated) to lend in the Fed funds market and so, if EFFR keeps bumping up against IOER after a theoretical second technical tweak, the Fed will ultimately be forced to end QT early in order to avoid a liquidity squeeze. The early end to balance sheet normalization means the Fed will begin rolling over more of its Treasury holdings sooner than we thought previously. We also think it means that the Fed will remove Treasury supply from the secondary market when it reinvests agency debt and MBS principal into the Treasury market instead of the agency MBS market. In turn, the US Treasury will have to issue fewer Treasuries to the public than what we thought before. A larger Fed balance sheet may eventually be supportive for risky assets, but we expect the flow effects of normalization to hurt into 2019. We don’t think support will arrive until the balance sheet stops shrinking. We see the flow effects of balance sheet normalization, which should accelerate into 4Q18 and 1Q19, negatively affecting US corporate credit and equities (in a continuation of the rolling bear market). We think agency MBS should suffer from reduced demand into a bull flattener, but actual performance will depend on how agency MBS paydowns are reinvested. On a 12-month horizon, we suggest investors overweight US Treasuries, underweight US corporate credit, be neutral agency MBS versus Treasuries and overweight agency MBS relative to credit. Try and stay with me here. 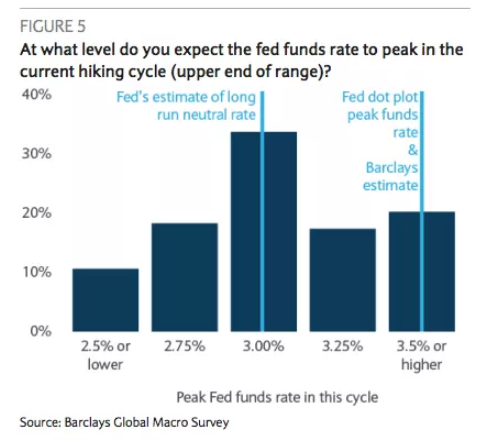 The point of walking you through the Morgan Stanley projections is to underscore the extent to which investors and analysts doubt, for one reason or another, the Fed's ability to normalize policy. Those doubts, irrespective of what informs them, seem to be at odds with the relatively benign outlook for how severely the trade tension will affect global growth. This era has also seen rapid secular debt growth, an increase in market based financial intermediation, high derivatives use, and large capital flows. The era’s two biggest recessions – 2008 and 1991 – involved deleveraging, credit crises, and messy bankruptcies of financial and non-financial firms. In our view, the causal relationship between those balance sheet problems and recessions runs both ways, with those recessions intensifying when balance sheet dynamics weakened by a slowdown started to constrain behavior which then worsened activity further. The bank's subsequent assessment of balance sheet health in the U.S. is, well, balanced (pardon the bad pun). On the bright side, they note that looking at gross leverage can be misleading (net debt is sitting near its three-decade average), maturity profiles have been extended (thanks in no small part to post-crisis monetary policy) and the stock of liquid assets on corporate balance sheets is now sufficient to cover more than half of short-term liabilities (if you're not up on such things, that is very high historically). That said, there are problems. 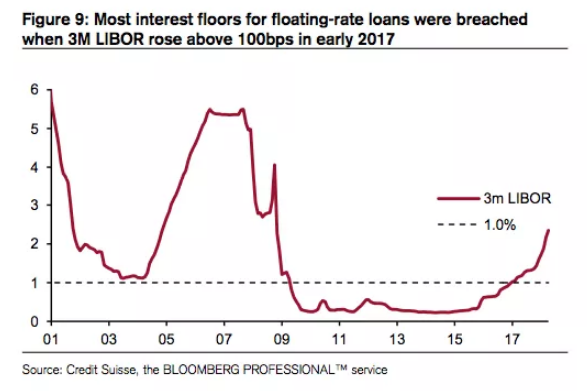 Notably, the desperate hunt for yield combined with the newfound threat of rising rates has catalyzed voracious demand for CLOs. That demand is at least in part responsible for a rather disconcerting trend in the market that's seen covenant-lite deals comprising a larger and larger share of new supply, which has in turn left three quarters of the leveraged loan market cov-lite. That's all fine and good unless interest costs rise so far, so fast that issuers can't keep up, in which case things can get ugly very quick. The Fed is surely aware of that scenario. While we're on this subject, do note that the Q1 dollar funding squeeze, which was precipitated by the knock-on effects of the tax cuts and the spending bill (e.g., repatriation effects and T-bill supply), breached the floors for floating rate borrowers. This is where I get to refer you back to an all-time Heisenberg classic post called "'FRYBOR': Conversing With Drunk Albanians". All in all, there seems to be a bit of cognitive dissonance within both the buyside and sellside communities when it comes to positing, on the one hand, a benign scenario wherein strong U.S. earnings, a robust U.S. economy and a reasonably favorable resolution to the trade tensions allow everything to proceed apace and, on the other, a Fed that won't ultimately be able to complete the normalization of policy due to a variety of concerns ranging from technical problems (see the above discussion from Morgan Stanley) to the possibility that the trade war mushrooms into something that represents a threat to global growth. Generally speaking, I'm inclined to believe that the benign scenario is far-fetched at this point, if for no other reason than the fact that the "synchronous global growth" narrative that defined 2017 has morphed into a U.S.-centric story that implicitly assumes this expansion will end up being the longest in recorded history. I'm not sure that is a safe assumption. When you throw in the fact that the Fed is effectively hamstrung in its ability to respond quickly by the necessity of guarding against a scenario where the combination of late-cycle fiscal stimulus and tariff-driven price increases spurs an acceleration in domestic inflation, you've got a less-than-ideal setup. Coming full circle, I'm not keen on pushing an overtly bearish narrative just for the sake of being pessimistic. But I am keen on conducting a rigorous examination of the underlying dynamics at play both in markets and on the geopolitical scene. The above represents just such an examination. In short, I'm not the bear you're looking for. But I'll be him today. Precise evaluations of current and future global trade patterns are more important tan ever. The first rule of studying international trade is that no single rule, statistic or equation is capable of adequately explaining either current or future trade patterns. Trade is too intricate and too variable, its shape naturally adjusting to conflict, politics, disruptive technologies and so on. This makes reliable data difficult to collect, and the presentation of trade data, like any statistic, can be manipulated to support almost any argument. Anecdotal evidence can complete the picture, or even paint a different one, and thus is just as important as what the numbers say. Ultimately, even the most elegant system of trade-related econometrics must judge itself not on the cleverness of its equations but on whether it describes reality accurately. Despite the inherent difficulties of this work, the ability to precisely evaluate current and future global trade patterns is more important than ever. Protectionism is back in the news. In truth, protectionism never went away, and lest we think this is only a U.S.-driven process, we need only remind ourselves that Canada and the U.K. intimated last week that they were considering certain protectionist measures unrelated to U.S. moves. The international trade system since 1945 has been deeply marked by a veneer of free trade, but no one would assert that the progression toward freer trade is linear, an inevitable end of economic history. In recognition of the need to do this important work and to make our analysis more accessible and transparent, GPF is exploring new quantitative ways to analyze trade relationships. We are beginning with a fairly unambitious goal: We want to establish a way to quantify the relative dependency in a bilateral trade relationship over a single commodity. The basis of our approach comes from a 1991 analysis by GPF founder and chairman George Friedman in relation to Japan’s dependence on imports. This approach is by no means sacrosanct, nor do we think it is a perfect representation of trade dependency. We do, however, think it is a useful tool for starting a more holistic conversation about how trade works – a conversation sorely missing from the present media environment. This approach depends on establishing a relationship between three variables. The first variable is the importance of the commodity or good to the importer. Take, for example, Canadian imports of U.S. steel. We need to know how much steel Canada imports from the U.S. and how much it imports from the world overall. Dividing the Canada-U.S. import relationship by Canada’s total imports gives a sense of Canadian reliance on the U.S. for that commodity. Note that this is measured by physical weight (or in the case of a finished good, number of units), because that is more important to the importer than price. The second variable is the importance of the trade of the commodity or good to the exporter. For the exporter, the monetary value of the trade is more important than the quantity – after all, the goal of the exporter is to make money, while the goal of the importer is to acquire a commodity or good. The second step, therefore, is to measure the importer’s payment for the import in relation to the total amount the exporter derives from that commodity or good in general. 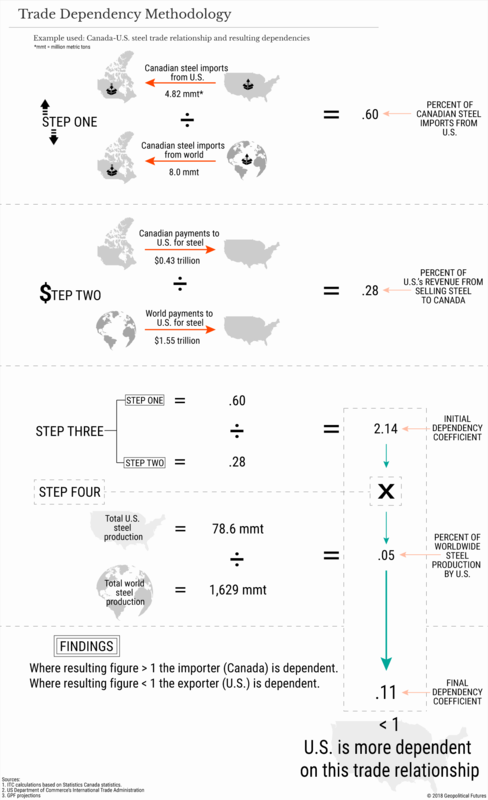 To use the example above, that would mean determining the amount Canada paid the U.S. for steel, and then dividing that figure by total payments for all U.S. steel exports. Once these two relationships are established, a final variable is determined: whether the importer could easily find another source for the commodity or good in question. For this, we return to weight or unit measurements, and we compare the exporter’s production of the commodity or good (in this example, steel) to the total production of said commodity or good in the world. This last step is in many ways the most crucial. If the total availability of the commodity or good indicates that it would be fairly easy to find alternative sources, what might have looked like a highly dependent relationship for the importer can become a highly dependent relationship for the exporter. By dividing the ratios established in the first and second variables, and then multiplying that figure by the ratio established in the third variable, we are left with a figure that gives a relative sense of dependency. If the figure is greater than 1, the importer is vulnerable; if it is less than 1, the exporter is vulnerable. The further the figure gets from 1 in either direction, the greater the dependency. For example, the vulnerability coefficient for Japanese imports of Australian coal in 1991 was 13.7, indicating that Japan was extremely dependent on Australian coal. (The figure has since dropped to 3.69, suggesting a trend of decreasing, if stubborn, dependence.) Conversely, Japan’s vulnerability coefficient for oil from the United Arab Emirates was just 0.01 in 1991, suggesting that Japan, which is almost entirely dependent on imports for its oil, nevertheless had the upper hand in the oil trade relationship with the UAE. This way of looking at dependence comes replete with flaws, as does any mathematical approach. It does not, for instance, account for the ability of the importer to produce for itself the commodity or good in question. It is also less valuable the broader the definition is of the commodity or good. Steel is a commodity, but there are many types of niche steel products. 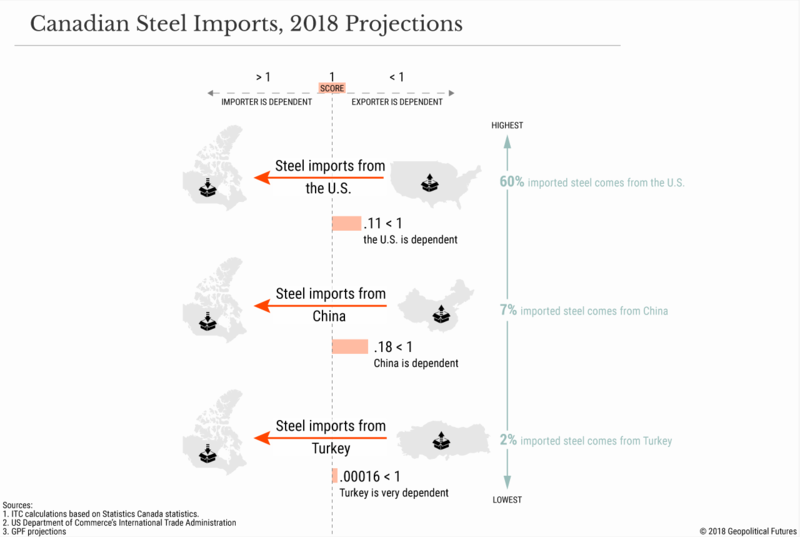 Canada may not exhibit a statistical dependency on U.S. steel imports overall, but perhaps it does depend on American coiled stainless steel wire, which would be very important in determining the direction of a trade negotiation. This means that to grasp the nuances of dependency requires highly focused analysis of specific commodities about which it will often be difficult or impossible to acquire the requisite data to make a calculation. GPF has always defined itself as an organization whose research is based on both qualitative and quantitative methodologies. For those to whom data is a religious principle, this has at times provoked negative reactions. They believe “qualitative” is a dirty word for lacking rigor. But blind attachment to data is equally lacking in rigor. We have always tried to find a medium between these two poles, both trusting what we see while developing mathematically driven ways to simplify a complex issue like bilateral trade. We will use the approach above increasingly in the coming months. Indeed, our first analysis on this issue will appear later this afternoon. As always, we welcome your feedback – especially from those who see solutions to the flaws inherent in this approach. One does not need an economics degree to engage in this kind of work; real-world observations can be just as valid as attempts to describe reality through equations. This is not a knock on economists but a testament to our readers, who have a great deal of both to offer. We invite you to join us in better understanding international trade as old patterns begin to transform. WASHINGTON, DC – As the World Cup unfolds, captivating soccer fans around the globe, the broad appeal of high-level sports is on full display. But the impact of sports extends far beyond major international events, as impressive they may be, to include far-reaching benefits for ordinary people. Initiatives that encourage people to exercise regularly can help to reduce the incidence of strokes, cancer, and depression, resulting in higher productivity and lower health-care costs. These are important goals for a region like Latin America and the Caribbean, where one in four adults is obese – a trend that has worsened over the last decade. Sports can also strengthen social relationships, by bringing together people from different backgrounds and creating a sense of shared purpose and identity. Moreover, they can provide a productive outlet for young people, keeping them focused and engaged and boosting their self-esteem, thereby reducing their vulnerability to harmful social influences. And they can promote qualities like perseverance, teamwork, and leadership – the kinds of soft skills employers seek in job candidates – while even supporting gender equality. In short, sports programs are good for individuals, communities, and countries. That is why, since 2004, the Inter-American Development Bank (IDB), of which I am president, has supported sports-for-development programs for at-risk youth in 18 countries. Such programs often combine the sport itself (namely, soccer) with vocational training and internships. The results are promising, to say the least. Around 70% of participants complete the program; of those, more than 65% get formal jobs, return to school, or start a business within one year. A project carried out in El Alto, Bolivia, used soccer to enable more than 600 girls to learn leadership and other useful life skills. Though we have only limited data on their progress, we know from other research carried out in the United States that participation in sports can have long-term benefits for women, including higher educational attainment and job earnings. Despite these benefits, Latin American and Caribbean countries spend a relatively modest 0.1% of GDP on sports programs with broad social goals – about one-third as much as their European counterparts. Does this mean that these countries should increase their investment in sport? It depends on the investment. Not all sports programs are created equal. In Europe, researchers have found that youth recreation centers where activities are not structured sometimes become gathering places for kids involved in high-risk behavior such as gang activity. Highly structured programs that build strong relationships between students and their coaches or other mentors are much more effective. For example, supervised sports programs for schoolchildren can be strengthened as part of efforts to extend the school day – an accelerating trend across Latin America and the Caribbean. 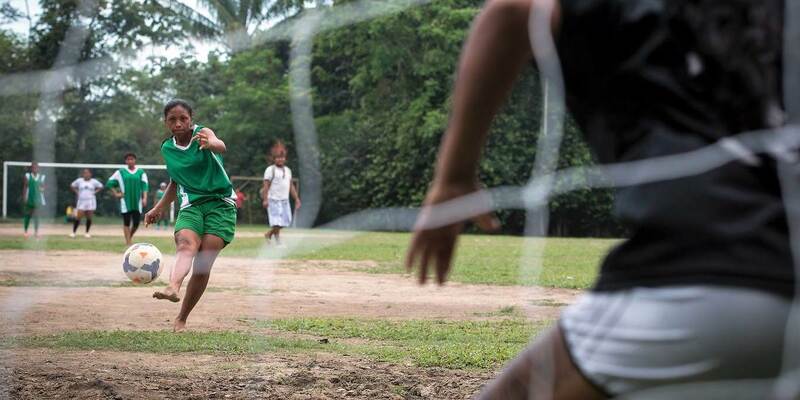 The IDB’s research and experience with sports-for-development programs supports these conclusions, indicating that the value of pubic investment depends on the specific strategy. But it is not yet clear precisely which strategies work best. Thus, to maximize the economic and social benefits of government investment in sports, policymakers need more information. Specifically, there is a need for more experimentation, improved data collection, and careful evaluation, including reliable comparisons with competing approaches. At the IDB, we have found that the key is to test pilot projects and assess the data that are generated. Governments and other organizations, including development institutions like the IDB, can then work together to scale the programs that prove most effective, while applying the lessons of less effective interventions. Much like scoring a goal, hitting a home run, or dunking a basketball, making sports-for-development programs work requires a lot of practice, not just to master the technique or approach, but also to be able to apply it to diverse circumstances. What happens on the playing field depends on everything that happened before – the failures as well as the successes. If governments are not willing to put in the work, their investments will not be worthwhile. If, however, they commit to the experimentation, evidence collection, and evaluation that all smart public spending requires, sports-based investment can go a long way toward strengthening communities and enabling young people to live healthier, happier, and more productive lives. Luis Alberto Moreno is President of the Inter-American Development Bank, and a member of the World Economic Forum’s Foundation Board. Ottawa wants to avoid becoming dependent on Chinese suppliers. As U.S. tariffs on steel hit markets around the world, Canada is considering ways to protect its own steel producers. The Canadian government is preparing to impose a combination of quotas and tariffs on steel imports from certain countries including China, according to a Bloomberg report last week that cited “people familiar with the plans.” This in addition to the Canadian tariffs on U.S. goods (including a number of steel products) worth 16.6 billion Canadian dollars ($12.6 billion) that went into effect on July 1. According to the Bloomberg report, which remains unconfirmed, the new measures would be meant to prevent Chinese steel, in particular, from flooding the Canadian market to avoid duties imposed by the United States. That is only partly true. The broader issue is China’s steel dumping practices in general. With the U.S. attracting so much attention, Canada is now quietly considering imposing protectionist measures of its own that are not too different from those levied by its southern neighbor. China’s dumping of steel on the global market has reduced steel prices and, in so doing, hurt the bottom line for Canadian steel companies, as well as companies from many other countries. It has also led to an increase in Canadian imports of Chinese steel. Though the U.S. is still by far the largest supplier to Canada – 55 percent of Canadian steel imports came from the U.S. last year, compared to just 7 percent from China in 2018 – China’s share is increasing while the United States’ is decreasing. And the sheer volume of Chinese production is an advantage for Beijing. Right now, Canada isn’t overly reliant on China – it has access to cheap steel from elsewhere. But its reliance is increasing, and that could leave Canada in a vulnerable position in the future. Canadian imports of Chinese steel increased 26 percent in the first five months of 2018 compared with the same period in 2017. The only way for Canada not to become dependent on Chinese steel is to impose tariffs, quotas or other protectionist measures. After all, China has already shown it will not reduce production. (Whether that’s because of a lack of will or ability on China’s part is a key question, but we’ll leave that aside for now.) If Canada were to block Chinese steel imports, it would likely increase U.S. imports, but this wouldn’t make Canada dependent on U.S. steel. It would merely replace Chinese imports for U.S. imports – a better position for Canada even with the tough stance U.S. President Donald Trump has taken on trade. It’s also likely that once NAFTA talks are completed, the U.S. will grant Canada an exemption to steel tariffs – which the Trump administration has often used as leverage in the negotiations. Another country on which Canada could consider imposing tariffs is Turkey. Turkish steel imports to Canada have increased a whopping 615 percent from roughly this time last year. Still, Turkey is far more dependent on Canada as a market than Canada is on Turkey as a supplier. Even if Canada blocked Chinese steel from entering the Canadian market, the trade relationship between Canada and Turkey would remain roughly the same, with Turkey more dependent on Canada because Canada would still have many other potential suppliers to fall back on. Even though Canada is not in danger of developing a dependency, the large increase in Canadian imports of Turkish steel looks bad politically, and for the purpose of boosting domestic production, Canada may decide to take aim at Turkish suppliers. Prime Minister Justin Trudeau is, after all, facing elections in 2019 and may be looking for a boost among certain constituencies in which he is currently unpopular. Moreover, a few tariffs, paltry when compared to those imposed by its southern neighbor, would likely go relatively unnoticed on the world stage. For Canada, it comes down to a simple question: Is it preferable to have cheap steel and a potential trade dependency on China, or more expensive steel without any significant dependency on a single country? Ultimately, the latter is the better option. And if Canada no longer trusts the U.S. as a trade partner and wants to be self-sufficient when it comes to steel, it could achieve that as well: Canada can produce enough steel to meet its domestic demand, though this would require investing in the production of stainless steel, for which Canada currently relies on imports. But self-sufficiency is likely a bridge too far – especially for the present government, which has vehemently supported free trade. Tariffs on Chinese steel can be far more easily justified to Trudeau’s base than broader tariffs that would target a variety of countries. Most important, Canada is better served strategically by staying close to the United States. Given the choice then – and on steel imports, it looks like Canada is, for once, in the driver’s seat – we expect Canada to try to restrict Chinese steel imports while encouraging imports either from the U.S. or other countries with which it has closer ties. President Trump will soon nominate his second Supreme Court justice. The first, Neil Gorsuch, has so perfectly replaced the late Antonin Scalia that it’s safe to assume retiring justice Anthony Kennedy’s successor will be in the same mold – which is to say formidable and unapologetically conservative. The result will be a solid conservative majority that’s more definite and less flexible on the issues where Kennedy was a swing vote. And that’s if Notorious RBG manages to hang on through the Trump era. If she goes (and at 85 she’s likely to go soon one way or another) Trump will be one of those extremely rare presidents who gets to name THREE justices, thus extending his influence from four years to an entire generation. Among the possible results of such a conservative judicial super-majority are the reversal of rulings that made abortion and gay marriage the laws of the land, making both state-level issues once again, where they’ll further polarize already-divided electorates. Meanwhile, the Democrats are lurching waaayyy left. The implosion of the moderate Clinton wing of the party began during the past presidential election, when huge parts of the left openly supported socialist Bernie Sanders. This group now sees Elizabeth Warren – Bernie Sanders with a penchant for verbal street fighting – as the ideal candidate next time around. And despite a fairly consequential set of primary elections last Tuesday, pretty much all anyone is talking about is Alexandria Ocasio-Cortez, a latina “democratic socialist” who unseated a previously entrenched moderate incumbent and is now a lock to win a Bronx congressional seat in November – on a Sanders-esque platform of free everything for everyone and wide-open borders. They came from all over, took planes and buses from 47 states, slept at friends’ homes or in churches and prepared to be arrested Thursday in Washington, D.C. Most of the participants were white women, stumbling over the syllables of Spanish-language chants. Many had never faced arrest before. But here they were. Capitol Police said 575 protesters were arrested and escorted out of the Hart Senate Office Building in a mass demonstration that called for the abolishment of the U.S. Immigration and Customs Enforcement agency, and an end to migrant family detentions and the Trump administration’s “zero tolerance” immigration policy. They were charged with unlawfully demonstrating, a misdemeanor. Just after 3 p.m., protesters were rounded up in groups of a dozen or more and led out of the building. A riot was declared in downtown Portland, Oregon on Saturday evening as the city exploded into its worst protest violence of the Trump era. More than 150 supporters of the far-right Patriot Prayer group fought pitched street battles with scores of anti-fascist protesters. In total, nine people were arrested. The far-right march had started near Schrunk Plaza in the city centre, where the rightwing group had held a rally, led by the Patriot Prayer founder and Republican US Senate candidate Joey Gibson. As soon as the group left the plaza, they clashed with anti-fascists who had been waiting across a heavily barricaded street nearby. As the two groups came to blows, Department of Homeland Security officers fired non-lethal ammunition towards the counter-protest. What does all this late-1960s-esque turbulence mean and how does it tie into the populist wave that’s sweeping the rest of the world? The simple answer is that when a society borrows too much money it loses the ability to keep its people happy. The big systems stop working as pension plans and local governments run out of money, inequality becomes a chasm as the people with assets get richer while the people with debts sink into poverty, and disaffected voters lose faith in the establishment to address their needs. And they come to hate the people on the other side of major issues — even though those people are frequently also victims of the elites’ predation. Each election becomes an adventure in which formerly fringe candidates do progressively better until they end up taking power. At which point the discredited center evaporates and everyone chooses one extreme or the other, losing any remaining shred of empathy for their political opponents. Is America headed toward a civil war? Or is the civil war already starting? White House press secretary Sarah Huckabee Sanders was even kicked out of the Red Hen restaurant in Lexington, Virginia, because the owner and employees disliked her politics. This seems like a small thing, but it would have been largely unthinkable a generation ago. And, in a somewhat less “soft” manifestation, Homeland Security Secretary Kirstjen Nielsen was bullied out of a restaurant by an angry anti-Trump mob, and a similar mob also showed up outside of her home. Marriage counselors say that when a couple view one another with contempt, it’s a top indicator that the relationship is likely to fail. Americans, who used to know how to disagree with one another without being mutually contemptuous, seem to be forgetting this. And the news media, which promote shrieking outrage in pursuit of ratings and page views, are making the problem worse.